Today's sewing project is a little different than my usual quilty or crafty things that I love so much. I do this project because I love the person who wears these so much. I am very proud of my Harley riding, Navy veteran husband. Over the years we've been on many motorcycle rides. We both enjoy the thrill of the open roads. 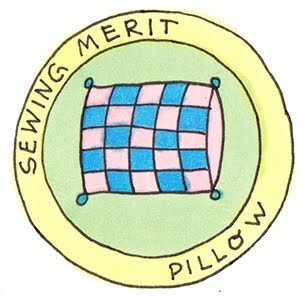 In fact when he want to take a long ride, and doesn't have any plans to head to a specific place, I can get him to take me to far-away quilt shops. For him, any excuse will do to take a ride. I joke about how a prerequisite of living in the Milwaukee area is that you must own a Harley motorcycle. And we do. As an added benefit, our daughter, Jennifer works in clothing design at Harley which gives us the opportunity to meet many wonderful people from the company including her boss, Karen Davidson. One of our most memorable trips was to Sturgis where we actually rode along with Willie G and Karen and their entourage. Plus we get some of the samples to try out before they hit the market, how cool is that?! But I digress. This is about the patches. We collect patches from Harley dealers and events on our travels. They make great souvenirs that are easy to carry in our limited luggage space when we are traveling on the bike. 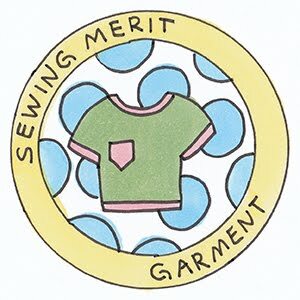 My to-do list includes sewing them onto my husband's vests. I am very delinquent in that task. 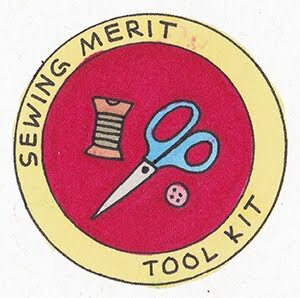 But in the last few days all I can hear out of my sewing room window is that low hum of the Harleys (some people say it sounds like 'potato-potato-potato...') coming in to town. With the 110th Harley-Davidson Anniversary Celebration starting today, the sound is constant which I find a little exciting. I imagine the places where they are coming from and I wonder how their journey was to get here. There I go, daydreaming again instead of getting to the patches. So I am inspired to get those patches sewed on so that Jeff can wear any of them as we go out to enjoy the events around town. He has a leather vest dedicated to the American Legion Riders, a group of veteran motorcycle enthusiasts that work towards raising money for the Legacy Fund and the Fisher House, two important causes that support veterans and their families. He also has a leather vest from our local HOG (Harley Owners Group) chapter. 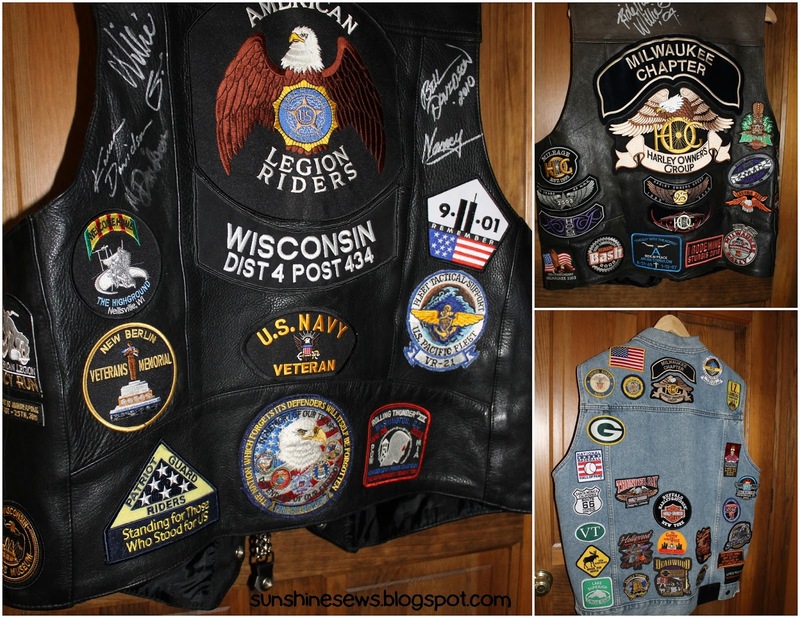 He wears the Legion Riders vest, of course, at all the ALR fundraisers and when the group is riding in parades. He wears the HOG vest when we are out going out of town. With the large Milwaukee Chapter patch on the back it's a way for people to see where we're from at a glance. The third one is a jean vest that is much nicer to wear because it is so much cooler in the summer than the hot, sweaty leather ones. But The leather ones have been around for years and have had patches on them as well as signatures from the Davidson family. It's a sort of status symbol if you have their autographs on your vest. They needed some new patches added so I got out my leather needle and got them all sewed on. The jean vest was a blank canvas, no patches, nothing on it. I thought that would be a good place to put all the patches that represented places we've been. But after getting them all on, I still had a large blank space. That's because I have patches from other cities however, I can't remember where I put them. I'm sure they are in one of those 'safe places' that seemed logical at the time, although I have no idea where exactly that would be. But they will turn up when I least expect it (hopefully soon). I love spring rolls. Especially ones I make from scratch. It allows me to put in more of the ingredients I like and take out stuff I don't like. The tough thing about these is that it is a little time-consuming. There's making the filling, then letting it cool. Then rolling up the filling in the spring roll wrappers. Then there's the cooking part. I deep fry these on my stove which can be a little messy but oh so worth it. They are that good. Heat wok over medium heat, adding one tablespoon of oil. Sauté garlic about 1 minute, add green onions, carrots, and cabbage and stir fry for 3 minutes. Add pea pods and bean sprouts, cover and cook about 2 minutes. Combine 1 tablespoon of cornstarch with 1 tablespoon of water and add to pan along with the sesame seed oil and soy sauce. Cook and stir until mixture thickens. Remove from heat and allow to cool completely. Separate spring roll wrappers and cover with a damp towel to keep moist. Combine 2 teaspoons of cornstarch with 2 tablespoons of water. Working with one wrapper at a time, wet the edges with the cornstarch mixture. Place 3 tablespoons of the vegetable mixture in the center of the spring roll wrapper and roll up diagonally, tucking in the edges. Heat the corn oil in a wok to 375° Working in batches, add spring rolls and fry until golden for 1 minute. Remove from oil and serve hot with plum sauce or a mixture of rice wine vinegar and soy sauce for dipping. 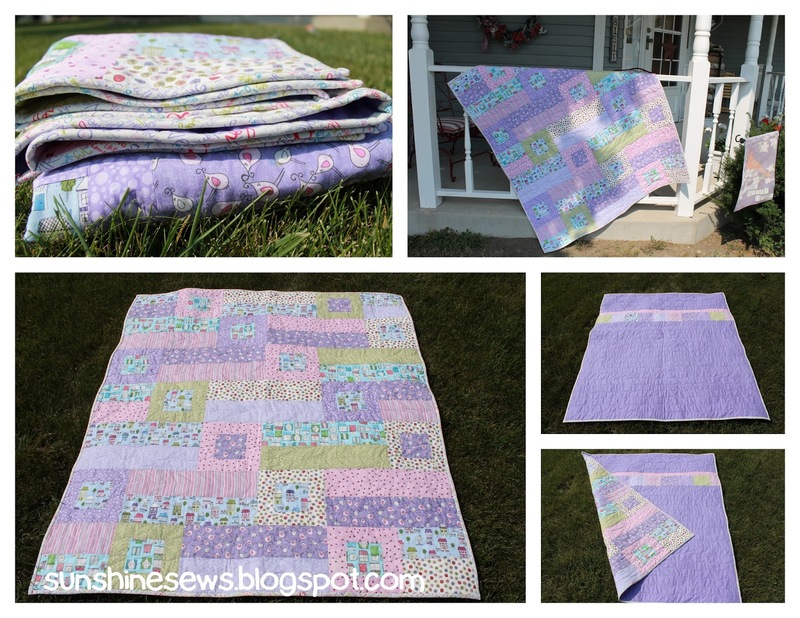 I ordered the Thimble Ruler set a few weeks back in order to make this quilt. I just love the Noteworthy collection from Sweetwater. So much so that I had enough fabric to make two quilts. Anyway, the size of the ruler allowed for pretty large pieces that would make each piece a focus piece. I followed the tutorial on the Riley Blake design blog and you can find the link for it here. My new friend from Quilts for Kids, Renee let me use her AccuQuilt and the dies in order to cut the flowers for this quilt. I also used some on the back. I took some of the leftover fabric to make the panel on the back. That happened by accident. The truth is I cut the ecru fabric wrong. It was supposed to be wide enough to go across the entire quilt and for some reason, I cut it way way to narrow. Therefore, I had to add some fabric to it and since I had to, I needed to make it look like I did it on purpose. So I cut the ecru fabric off center and spliced in the leftover Noteworthy. Just when I thought I was ready to put the layers together, I noticed the leftover flowers I had cut and it hit me at that moment that I should add them to the back for some consistency and continuity. I quilted along the edges of the tumbler blocks to add depth to each piece. Using the Noodle in a Haystack quilt pattern from Rodney Gile, I made this quilt. I finally broke open my fat quarter stack of Noteworthy by Sweetwater for this. It seemed like a great way to use the 30-plus fabrics in the collection. And I did use them all! I also had some extra yardage of the Noteworthy collection and used the fabric, Plant a Garden in the color, Cloudy for the back. I quilted it with random stitch lines to complement the randomness of the 'noodles'. I've always liked these collections of quilting fabrics from Heidi Grace. They're all in pretty pinks, purples and aquas with the most adorable little houses, birds, windows, and other simple and pretty patterns. I've had this fabric sitting around for a very long time (years) when I came across a quilt called 'cub crawl baby quilt' by John Q Adams. 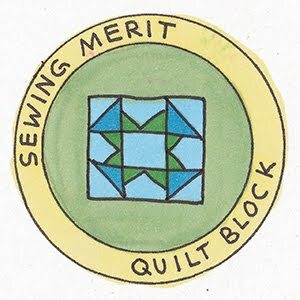 It's in a book by Fat Quarterly called Shape Workshop for Quilters. As he hints by the title of the quilt, the one Mr. Adams made has bears and other cute wildlife prints. So I think for my purposes, I should change the name of the quilt pattern to 'a birdie's view'. I thought this pattern would go well with the fabric because the blocks are quite large so that all the fabric can be showcased within the quilt. And I love how quick and easy it was to piece. I machine quilted it with wavy lines to soften the look of the large blocks which also created a nice contrast. I love gardening just about as much as I love sewing. Both produce such rewarding results. Every year I try to plant something new and different in my garden. This year the new includes cabbage and the different includes tomatillos. It hasn't been a very warm summer so I'm not sure when I will see tomatillos, however the cabbage is doing great. As you can see from the photos, my first head harvested is a very nice size. So it's time to make some soup. Between my garden and the farmers' markets, I have some beautiful produce and there's nothing like a nice vegetable beef soup for a light supper. This is an easy recipe and since the soup doesn't take much more than an hour to make, the vegetables are still firm, preserving their fresh taste. I serve it with some nice artisan bread. Heat 2 tablespoons oil in a large pot over medium-high heat. Sprinkle beef with salt and pepper. Add beef to pot; sauté until outside is no longer pink, about 4 minutes. Add carrots, chopped onion, chopped garlic, and bay leaves. Sauté 5 minutes. Add the beef broth, tomatoes with juice, cabbage and potatoes. Bring to a simmer. Partially cover the pot and simmer until beef and vegetables are tender, about 50 minutes. Stir in corn and peas; simmer until tender, about 5 minutes. I've had this adorable fabric since last summer. It's called Unforgettable for Quilting Treasures and is licensed by Desilu, LLC for I Love Lucy & CBS. The thing about that is I don't understand the connection. The I Love Lucy Show was about the antics of a housewife married to a Cuban bandleader. The fabric itself reminds me more of something from a television show of the same era called 77 Sunset Strip. The colors are beautiful and the fun map and road sign fabrics are so very cute that it seemed like a no-brainer to make it into a bag. 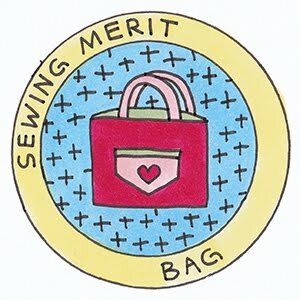 And I've been wanting to make 'The Cinch Bag' ever since I saw it on the Sew Can She blog. The problem is that I didn't know what I wanted to do with the fabric when I got it on sale and I really love the teal stuff more than the road sign print so I only bought 1 yard of the teal and a half-yard of the coral print. The Cinch Bag needs 2/3 yard of fabric for the bag and 1 2/3 yards of fabric for contrast. The tutorial for the bag had all the parts out of contrast except for the main bag. So how was I ever going to make this work? Since I liked the teal best, I cut the main bag out of that first. Then I knew the casing should be the highest contrast so I cut that out of the coral print. With not much coral print left, I cut the handles out of it. There were supposed to be 4 pieces cut of the same fabric (inside handle, outside handle times two) but I did not have enough coral so I cut the 2 outside handles from the coral and the inside of the handles from the teal. The ties were cut from teal since that was all I had left. So now I am down to a 7-inch strip of coral print. I decided that it could line the inside - all I had to do was add some other fabric for the rest of the lining since it wouldn't be seen (except by me) anyway. So I grabbed a chunk of Kona white for the bottom of the lining. Again, since it would only be seen by me, I did not change the thread color when I put the inside zipper pocket in. So the blue thread really shows against the white. The tutorial for this is from Sweet Verbena and you can find it on her blog. Here is the link.